In 2015, everyone wants the index card version of everything. We don’t have time for the full story; we desire only the broad strokes, preferably 140 characters at a time. Long form is considered anything over two pages, and it better contain an infographic and an executive summary. We consume and quickly move on to what is next. Some stories are worth much more. The Reverend Martin Luther King Jr’s is one of those stories. To many children (and far too many adults) his life is largely summed up by one speech and martyrdom. We know conceptually that the man led a nonviolent revolution, but few of us can appreciate the sacrifice and vision. Nor are we capable of grasping the reality of that historical place and time. 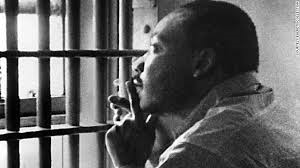 On the eve of the observation of Dr. King’s birthday I spent my Sunday afternoon re-reading “Letter from a Birmingham Jail”– King’s answer to his critics and call to action. I’d tell you more, but an executive summary won’t tell this tale. You can’t tweet greatness. You owe it to yourself to find 15 minutes to reacquaint yourself with a true freedom fighter, in historical context, in own his words. Dr King’s legacy isn’t in a textbook, and it isn’t a speech. It is the resonance and application of his words, even today.